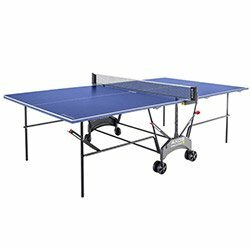 You want to buy the best ping pong table but don’t know what to choose from the hundreds of available ones on the market. There are different brands and different types, each with their own pros and cons. How do you choose the right table tennis table for personal use, for your club or for your startup? This article will answer all your questions and help you make the best possible decision. We split the table reviews into two categories. Outdoor tables and indoor tables. This way you can go directly to the section that you need and find your table. The scores should be compared within their own category. So an 8 for indoor is not necessarily better than a 7.5 in outdoor. Water resistance is not as important for an indoor table for example, so it will not factor in. These days not everybody has the time to read a whole article, and that is ok. Here is at a glance our best pick. Here are the tables in a table. Pun intended, couldn’t help myself. You can sort whichever way you like and choose the best one for you. This is a huge article and you can get lost pretty easily. This table of contents will make your life a lot easier. 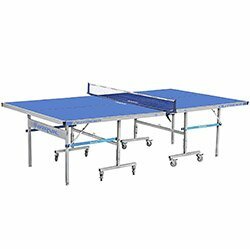 Jump to the review that interests you the most or just scroll down for some tips on how to choose a table tennis table. Here we go. How DO you choose a table tennis table? Here are some things to consider. Where are you going to use it? How thick is it? Is it sturdy enough? How well do you play? We cover all of these and more below. Do you have enough space inside your house for a full-sized table? Can you have it set up in your game room, your home office or the attic? Otherwise, you can take advantage of the outside space by getting an outdoor table tennis setup. If you’re planning to have it in your shed or garage, then it’s still better to get an outdoor table as an indoor one can warp quickly over time. Humidity is bad for indoor tables. There are many different types of outdoor tables, but they all have something in common. The support and legs are usually rust-proofed and the surface is water-proofed to last longer. This ensures that your table tennis table won’t easily warp, become discolored or water damaged even if it sits out all day. Unless you plan on playing outside most of the time, it’s advisable to get an indoor table and experience comfort of your living room while playing ping pong. You can still take the table outside when the weather is good. Are you buying the table for casual play with your amateur buddies or some fun family time with the kids? Chances are, you won’t see much difference between a solid table and a high-end one beyond durability and quality of construction. In this instance, you’ll be better served with a mid-range table as the extra ball bounce and precision won’t affect your playing experience that much. If you’re not a professional player and just want a good table for your office, then it will be in your best interest to get a sturdier table. People won’t take extra steps to care for a table that isn’t theirs. So the trade-off between sturdy versus a table that gives a more accurate bounce makes more sense. Can your space accommodate a full-size table? Consider measuring the room beforehand and see if you’ve got an optimal playroom for the table. 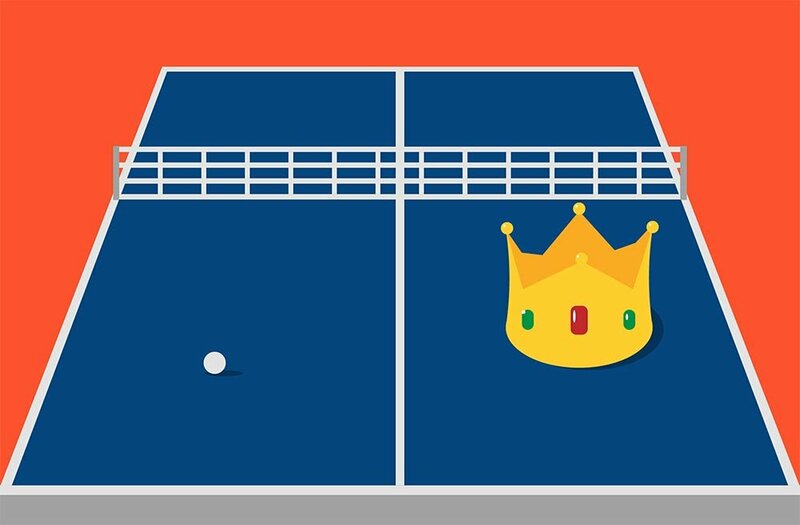 You’ll need to set a space allowance of at least a 3 feet on all sides (a pingpong table measures 9 by 5 feet) whether you’re playing for fun or for competition. Optimal space allowance is around 5 feet for all sides. You may have enough play space to play table tennis quite comfortably with a group of friends, but will you want to leave the table open once you’re done? You may need the space for something else once the game is over, and not all people have the luxury to allot one full room just for recreational purposes. If this is the case then you can opt for a table tennis table that can be folded or collapsed. This can be quite helpful when you need the room for something else. Fixed tables are set- once you put them in a room, they stay open. Folding ping pong tables, on the other hand, can be packed and are easier to store. Look for ones that also have wheels so you can slide them into your closet or in a corner more easily. 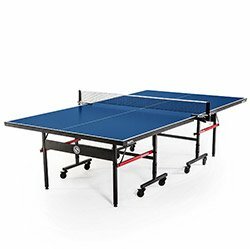 Table tennis tables can range from a few hundred dollars (the cheapest) to premium models that could burn a few thousand dollars in your pocket. Brand is pretty much a matter of choice, but for functionality alone, there are a lot of great tables out there. It shouldn’t cost more than $700 or so to have an awesome decent experience. 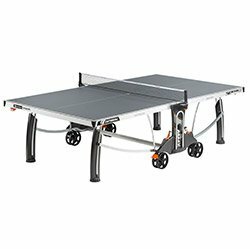 This range is perfect for casual players or those who want a ping-pong table for occasional family sports activities. Keep in mind that nets are an important part of a match as well. It’s better to choose quality as compared to cost in this aspect. Clip-on nets don’t offer much in terms of accuracy or adjustment. Retractable nets adjust to suit different-sized tables, but they’re usually not stable enough for serious play. Ok, so what makes a ping pong table great? What should you look for when comparing one table with another? The most important thing is surface thickness, but there are other things to consider. When it comes to indoor tables, a thickness of a 1/2 inch or less will not be your best option. The ball won’t bounce as accurately, the table itself is too flimsy and will easily get damaged. When measuring thickness for indoor tables, try to stay within the optimal range of 3/4 inch to almost an inch which is the standard used by clubs. Serious players will want a 1 inch thick top so they can simulate playing at a tournament. This type is understandably the most expensive one but you’re guaranteed the best playing experience. As for outdoor tables, because they are usually coated with a hard bonded resin or melamine, the top thickness can be a lot less. For example, a 5mm (about 1/4 inch) laminate top will give you a very decent bounce. For these types of tables you don’t want to go below 5mm and for the best experience, you want to go up to 7mm or higher. The sturdier, the better. You will want a table that’s guaranteed to last a long, long time to get the most bang for your buck. A poorly-made frame will buckle and bend over time, making it a pain to use. Non-folding tables have better frame strength as compared to their foldable counterparts. Cheaper tables are made from materials such as wood, while the most durable ones are made of stainless steel. Usability translates to having adjustable legs, wheels for easy transportation and easy folding. What’s more, some ping pong tables can be adjusted to be taller or shorter, which is a boon if you’re tall and playing with younger kids. Safety becomes a priority especially if you’re playing with your family or with smaller children. Fingers may be trapped when folding the table for storage, or it could roll over and hurt your feet if they don’t have proper locking mechanisms. Look for safety features such as levers for easy folding that can minimize the risks of an accident. Better yet, locks can prevent untimely collapses while playing. You can also get tables with padded corners to prevent unnecessary injuries to players and onlookers. All these things should help you get a better deal in the end. Keep in mind that surface quality, durability, and safety features will provide a better playing experience. This, in turn, will translate to a better investment over time. Now that you know a bit more about how to choose a good table you will better appreciate and understand the reviews below. These are in our opinion the best ping pong tables on the market while still considering price. Here we go! We'll start with the least awesome table first. Although this table was not our first pick, it is none the less a great table. It is made from good quality materials and the attention to detail is remarkable. The top has a 5mm resin laminate that creates a dense and hard playing surface. For convenience, this table features a built-in storage area on each side of the table for keeping rackets and balls. The table features a variable weatherproof netting system that can be adjusted for height or tension. This net can easily be folded to a compact size and stored in the table compartment when not in use. The storage compartment is large enough to fit all the rackets and balls that you will ever need. Built from premium materials, the table can hold up without any problems under extreme use whether indoors or outdoors. It is weatherproof so you can play in the rain without damaging the table or any of its components. It even has adjustable legs so you can play on gravel or other uneven surfaces. This is a heavy table at 140 pounds and it can be a bit difficult to move around when assembling. So keep this in mind if you were planning to put together the table by yourself. Because it is an Indoor/Outdoor table you can use it in the backyard, at a barbecue, in the office or in the game room of your home. It is one of the most versatile tables that you can get. Although 5mm is very respectable for a resin outdoor top, it is not going to give you the best bounce. If you are a serious player and are looking for a table that will help you improve your game, then keep reading as this table will not help you very much. If on the other hand, you are looking for a great, durable table that you can take out in the sun with your family or friends, then the Cornilleau 250S is a great pick. Next up, the Harvil Outsider which is a bit better than the 250S. It has a table top that is 6mm thick, which is made of weatherproof aluminum that is resistant to rain, humidity, UV rays and temperature extremes. This is a table that is built for outdoor fun and recreation. The Outsider is designed for portability and easy storage. It sets up quickly taking only 10 minutes from the time that you take it out of the box. The sturdy wheels feature locking mechanisms that keep them firmly in place when in play. Simply unlock them when you want ease in transport for moving or re-positioning the table. When you’re finished playing, the table top and legs fold, taking a lot less space and making it easier to store. When players want to play individually, this table can fold in half. It has a safety latch that guarantees the top will not open up during playback practice sessions. You can practice your strokes for hours on end to get that leg up on your friends. The table top is made of a durable aluminum material that is highly resistant to damage and corrosion. Four powder-coated steel legs hold the table securely upright. The top is finished with vibrant white lines on the playing surface that outline the boundaries for regulation play. The steel frame is also powder coated for strength and resistance to weather. The Harvil package does not have a special weatherproofing treatment for the underside of the table which can be a problem in certain weather conditions. In addition, paddles and balls must be purchased separately. This is an excellent outdoor table tennis table. For a 6mm thick table, it has a more than decent play bounce and the durable and weather resistant surface makes it perfect for outdoor use. It also comes with an excellent quality net and posts. The Kettler Outdoor is a 3/4 inch (22mm) thick ping pong table that has a top made from multiple layers of materials like wood, aluminum, and their patented ALU-TEC technology. It delivers a tournament quality bounce that is resistant to damage from high impact play. 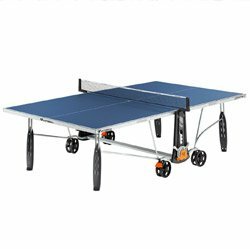 It is ideal for setting up at barbecues, campsites, in your backyard or anywhere you want to enjoy a high-level session of table tennis. This table comes with a waterproof top that also features the patented Alu-Tec climate control on the underside to protect the entire table from a variety of weather conditions. This and the thicker top is what sets it aside from the Harvil Outsider. The table has a dual lock safety feature that holds it firmly in place when in use. It folds out easily to a size of 108 L x 60 W x 30 H inches. When it’s time to put it away, it folds conveniently into a compact size of 19.29 x 60 x 67 inches. It is also equipped with 4.5-inch dual-wheeled casters to make it easy to transport and store. The table is remarkably stable with no leans or wobbles. The only downside is that some people have had a little difficulty assembling this table. The instructions are mostly illustrations and you must pay close attention to detail. The 4.5-inch wheels work well but they do not have a locking mechanism like other tables on our list. The net is great, but the connection system for attaching it is a little confusing for some. Unlike the Harvil this table tennis table comes with two Kettler Halo 5.0 paddles, a 6 pack of 3 star balls and a Kettler outdoor cover to protect the surface. The table is highly durable and resistant to all types of damage from weather or intense play. It also comes with several useful accessories which are included for free. The included paddles are decent for casual play and the AluTec surface is preferred to wood by many users. This table is one of the best options if you’re looking for an outdoor table for fun with friends, family or members of your club. It offers excellent table action even for the most pretentious of players out there. The 22mm top sets it apart from most tables in this outdoor list but because it is made from wood-like materials it should be better compared to its indoor cousins. A 22mm table of this type is arguably comparable to a 7mm hard resin type table, which is still a very good thickness. The bounce is consistent on every side of the table and it approaches the high level, professional standards. Our second Cornilleau table on the list and one of the best outdoor tables out there. This one is a high-end regulation-sized table tennis table with a strong build which makes it ideal for using outside or indoors. It comes with large sized wheels that make it easy to move from one place to another and a high-quality net. The built-in leg levelers are useful when trying to play on an uneven surface such as at a park or at an outside barbecue. It’s a multi-purpose table that makes it one of the best tables for use in a variety of locations for both indoor and outdoor playing sessions. The playing surface features a 7 mm resin laminate for a smooth and dense playing surface. This offers a near perfect ball bounce that will satisfy even the more experienced of players. The patented Mattop finish has an anti-glare feature that eliminates light glare and ensures that the ball adheres to the surface for optimum play conditions. Corner protectors on the edges of the table are an additional safety feature that protects both table and players. After you're done with the day, the table folds to a size of 62“ H x 64” W x 30“ D for easy storage. The retractable net can be easily removed and stored as well, when necessary. To make it even easier to handle, this table comes with a carrying handle which can be used to pull the table into position. This ping pong table is a full-sized regulation table that is made out of strong and weatherproof materials for use indoors or outdoors. The playing surface offers a smooth and responsive area with enough grip to encourage the best possible ball reaction during play. It can be used as well in a home or office as it can in a park or camping area. The versatility of this table makes it a very cost-effective acquisition. The 500M is best for players who are interested in owning a high-quality product that is fit for use in a variety of recreational and competitive situations. It is one of the more expensive tables, but the Cornilleau brand is popular for making competition grade products which are good for novices as well as professional players. This table is no doubt on the premium spectrum. However, because of the useful features and versatility that it offers, it is a good deal for anyone who wants to play on a regular basis. Our number one outdoor pick. Truly a remarkable table that will accommodate a wide range of player types and situations. (While still being affordable). 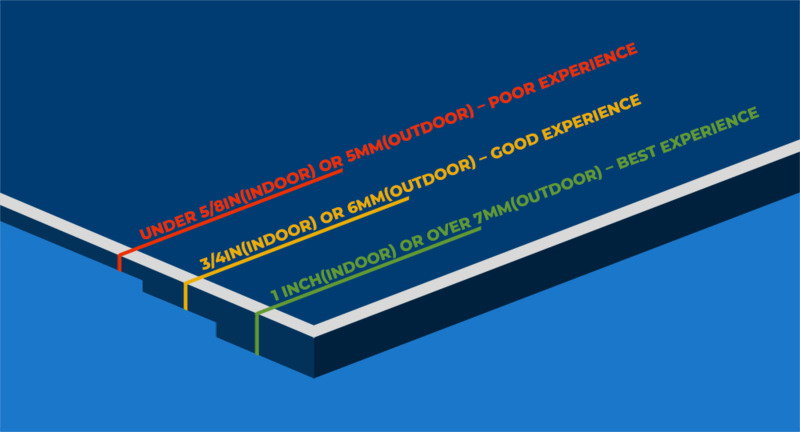 When evaluating table tennis tables with an indoor/outdoor ranking, it is important to pay attention to elements of the table that will be affected by outdoor play. The Joola Nova DX is designed with the highest quality and dependability which will offer a consistent playing experience. The design ensures that the netting and the deck are perfectly set and symmetrically aligned. You can use it in your backyard or it can be used as a park or playground set. The table is built by Joola, the official brand of the U.S. Nationals tournament. When the durability and design are considered, the Joola Nova DX stands out above the rest. Another important component that is essential when creating a great outdoor table tennis table is the ability to stand up to extreme weather conditions, including rain, heat, and humidity. The table top is immensely sturdy, possessing a 6mm thick surface that is made from a combination of aluminum and plastic composite. Unlike wood, this composite material is not subject to warping in the same manner as a wood table would be. The 6mm thickness puts this table into the middle to high bracket when it comes to ball bounce and performance. Because the table comes 95 percent pre-assembled you will be up and playing faster than you can say ”Ping Pong“. The estimated time of assembly is only 15 minutes and the instructions are easy to follow. Once assembled it will take you about a minute to fold for storage or take out to play again. Like other tables on this list, a great added feature is that it is split in half, allowing you to drop one half to take advantage of the play-back option. The fact the table can also be folded makes for easy storage when you are finished with it. This means that you can keep in the garage and still park your car in once you put the table away. You may be wondering why we chose this table over our number 2 spot. After all, the previous table has 7mm top thickness and this one features only a 6mm one. Well, for starters, 6mm for a composite/resin type tabletop is nothing to scoff at. But this particular table offers an awesome ball bounce and very good accuracy. But when you take the price into consideration you really start to understand our decision. Sure, you can get the 500M, and you may really find that it was a better option for you, but this table offers similar performance at a third the price. No brainer in our opinion. There are a number of remarkable outdoor tables on the market, but the Joola Nova DX Indoor/Outdoor table tennis table stands alone with its quality, versatility and price-performance ratio. It is the least expensive table on our list and one of the more peculiar tables. Joola’s midsize compact table tennis table is the ideal solution for playing in smaller spaces with your friends but especially with the kids. This table is designed with the same quality as regulation tables with dimensions of 72L x 36W x 30H inches, which is a standard height with a smaller playing surface area. It’s small enough to fit into a medium sized closet or it can be used as two separate tables for other purposes. The weight is just 62 pounds for easy moving from one place to another. It’s small enough to set up in a kids’ room, office, or other room in the house. The table comes fully assembled and ready to use right out of the box. All you need to do is unfold the legs and attach the net which is included in the box. This table is made of two halves that lock firmly into place for a decent ball bounce. The legs are pre-attached to the table top and unfold quickly for setup and fold up neatly when it’s time to put the table away. Lightweight yet durable materials went into the making of this table to keep it easy to set up, break down and store. 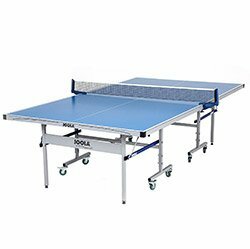 This is the best table tennis table for players who are looking for a lightweight and more compact table for smaller areas. The surface has a good bounce and it’s ideal for use in small rooms or for a ping pong table that is easy to move from one place to another. It does not, however, come with any special weatherproofing for outdoor use. The folding legs do not come with any special features such as height adjusters or locking wheels. The Joola Mid Size is perfect for kids rooms, offices or any other smaller area. It is the smallest table of the group and is made by a company that supplies tables and accessories for official competitions. Unlike the Kettler from the outdoor list, it doesn’t have adjustable legs so it must be used on an even surface. But comparing them is similar to drawing similarities between apples and oranges. This table is made to be used in smaller areas and lacks many of the features that the others include. Obviously, this is not table tennis table that you would get if you wanted to practice and improve your skills. There are much better options below for precision, high-performance table tennis. Still, it’s a high-quality table that has its place in our collection of the top five indoor tables. What this table excels at is fast, casual ping pong in the comfort of your house, without dedicating a whole room to the sport. The Joola Tour is one of the best tables for indoor play when you crave a full game on a regulation-sized table. The 9x5 playing surface offers competition grade size for tournament play. The ideal table for community gaming centers or for home use by players of all ages and skill levels. You can get this table in 3 table top sizes: 5/8 inch(15mm), 3/4(18mm) or one full inch(25mm) thickness. Obviously, the 25mm would be best, but unless you are starting your own table tennis club the 18mm one will do just fine. The surface is hard and made out of thick durable MDF board that is painted with multiple layers for a reliable ball bounce. The table is 95% pre-assembled in the box. The only thing you will need to do is attach the legs with 8 bolts and then attach the screw clamp net. The entire process takes about fifteen minutes. It also comes with a net, so you don’t have to worry about that. If you want to practice solo to further improve those moves, you can fold the table in half and go at it. Four wheels with locking mechanisms allow for easy transport of the table from one place to another. The 4 wheel trolley system features a locking mechanism that safely locks the table into place when in use as a full sized unit or when halved for playback mode. The steel legs are equipped with leg height adjusters for achieving a level playing surface. 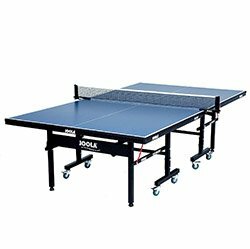 Joola Tour is a professional grade table tennis table that is suitable for competitive play, meeting requirements for regulation tournaments. The locking wheels make it easy to move and when locked they add extra stability to the table. This is the best indoor table for accommodating players from beginner through professional. It can be used in regulation matches as well as the office ping pong table. Here we go! Down to our top 3. These are the best tables on the market for indoor play. If you really want tournament quality play from the convenience of your home then the Joola Rally TL Pro is the way to go. Invite friends and family over for a few rounds or practice by yourself to improve your skills. As you know, a good table shouldn’t take hours to assemble and the Rally TL is no exception. The table is 95% pre-assembled so there isn’t much to do to get ready for play. It only takes an average of fifteen minutes to make this table ready for play. When folded, the halves rest on a 4 wheel trolley system that allows greater mobility for single person transport when nested together. The automatic anti tilting locks are used to easily fold or unfold the table for putting it into playback mode. The wheels also have a locking mechanism to make sure the table is stable and it will not roll away when you accidentally push the table. Like the Joola Tour and the coming tables below, it is available in three options: 5/8 inch(15mm), 3/4(18mm) or 1 inch(25mm). You have to choose based on your level of experience and how you will use the table. Read the section on table thickness if you haven’t already. No matter your choice, the surface is made out of thick medium density MDF fiberboard for durability and painted on in multiple layers for a smooth and consistent ball bounce. The legs are constructed of thick steel with built-in height adjusters for achieving a level playing surface. What sets this table apart is the cool design and added features. It has a sleek black surface with four built-in ball holders and two magnetic abacus scorers to keep track of your game points. These are excellent additional accessories that increase the value of this versatile table that can be used for home, office or in a local community center. This is one awesome table tennis table. It has a good bounce, it is affordable, easy to setup and easy to store. It has it all. The only reason it is not number one is that you can’t get it in 1-inch thickness. You can only get it in 5/8 inch and although it is on the low side, somehow it performs way better than its similarly priced competitors. The table top is made out of thick high-density MDF materials and is coated with a dark blue coloring. Silkscreen striping is applied to the tabletop with a finish that is smooth to the touch. The independent chassis creates a versatile table tennis table that can be converted into two separate tables for other uses. Four 1.5” steel legs in a square design offer strong support with adjustable leg levelers and a self-opening feature for automatic deployment when opened. A strong steel spring clamp post system ensures that the tournament sized cotton blend net holds up under frequent use. The exterior steel components are treated with exterior grade powder coating. The Stiga Advantage is a solid and durable product that is made with quality materials that are designed to last for years. 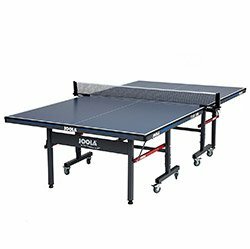 With high-quality materials, workmanship, and design, this table tennis table meets the criteria for being among the top choices in its class on the market today. Because it is only 5/8 inches thick we can’t recommend this table for professional play. The bounce is good but it is not at the level required for high performance. 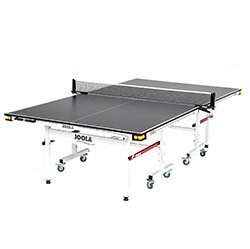 If you are looking for a table to practice at home for tournaments or to improve your skills, then just go with the Joola below. However, if you are a casual player and you just want to enjoy a session of ping pong with your friends, colleagues or family then this table will absolutely not disappoint you. This is an excellent choice for people who are looking for a high-quality table that comes with a variety of useful features. It’s not only crafted for smoothness and high playability, this table’s built-in safety features make it a reliable table for intense gameplay. Our number one choice. The performance, craftsmanship, features, and price make the Joola Inside the complete package. Yes, this is the best table you can get on the market right now and the best thing about it? It is crazy affordable. Like the other Joola offerings, you can get it in 5/8, 3/4, or 1-inch top thickness. 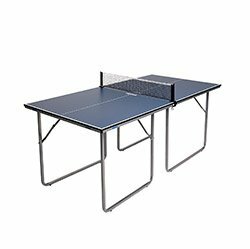 We recommend you get the 3/4 inch if you are planning to use the table casually and the full inch version if you are getting the table for your table tennis club. Either way, you will get a high performance, high-quality table that will not disappoint you. The Joola Inside is a beautiful ping pong table that will blend seamlessly in any room that you place it in. The dark blue top color is expertly matched by the black iron apron and thick legs. This is one of the best looking tables out there. It is made out of strong quality materials, which make it a very stable and durable table. Both the 3/4 and 1-inch thicknesses offer a consistent ball bounce, and it is grippy enough to react to whatever spin the ball may have. The only difference is in the bounce height which is slightly smaller for the 3/4 inch. The table is built out of two halves that can be easily joined together in the middle. It comes mostly pre-assembled, you just have to screw on the legs and clamp on the net and you are ready to start the game. You should be done with the assembly in no more than 10 minutes. The Joola Inside is a high-quality table that offers a lot of features and performance for its price. Some worth mentioning include the corner protectors, the powdered undercarriage to prevent rust, locking wheels, compact storage size, and the playback action mode. The legs can be folded so you can place the table against a wall to gain more space for solo mode. This can be done in less than 30 seconds and is a great way to kill time when you have no adversary to play with. This is a solid ping pong table that is built for longevity and will offer a consistent playing experience. The craftsmanship is amazing and the attention to detail is unmatched. It really offers a lot of value for the price you pay. The best thing about the Joola Inside is that it caters to every type of player. The base design and structure is the same for all versions. The only difference is in the table top thickness. This means that you get a great table if you are a recreational player as well as if you are a professional one. Not all ping pong tables are created the same. When you want the best, there are considerations to be made before you settle. With hundreds of tables on the market today, finding the table that best meets your needs can be time-consuming and difficult. We’ve taken the most important things into consideration including size, quality, and features. We’ve evaluated each tennis table and provided full details of their strengths and weaknesses. We hope that now you can make a better and more informed decision.